The foot is an amazing and intricate structure consisting of 24 bones held in place by their interlocking shape and fibrous connective tissue called ligaments. Additional support is provided by muscles as well as a very important structure called the plantar fascia. There are many common causes of foot pain. Below we shall discuss these as well as how you could begin your journey to becoming FREE from foot pain 100% naturally without the use of drugs or steroids. Is foot pain stopping you from keeping fit, playing your favourite sport, bush walking or simply not allowing you to wear your favourite pair of shoes? Foot injuries can be extremely painful and even debilitating in many cases as it is almost impossible to avoid using your feet for the length of time that would be required for inflammation in the foot to properly subside. Prior to your foot pain were you a fairly active person or possibly just trying to keep fit? Intense foot pain can even stop the keenest of athletes or enthusiast from participating in their favourite sport or activity. More importantly if you think that your foot injury is causing you restrictions now… you probably don’t want to hear that if you don’t resolve your foot injury soon it may actually lead to a secondary injury as you are unconsciously placing extra loads on other parts of your body trying to avoid the pain DOWNLOAD FREE REPORT. Did you know…. by identifying if your injury is acute or chronic you could actually help expedite your recovery? Foot pain may be either ‘sudden and acute’ or ‘slow and chronic’. If you are able to identify which of these categories your foot pain falls into, then this could well be beneficial in helping to identify and eliminate the cause. This can then dramatically decrease the recovery time. Have a read of the list below; we have included some of the most common causes of foot pain. Once you have identified your foot injury simply click on the link to discover some possible activities or causes that should be avoided to reduce the risk of further injury. We shall also discuss some existing treatment options… and see how the OSMO Patch, our 1oo% Natural treatment used together with proper rest is ideal for the reduction of inflammation and the relief of pain associated with many of these common foot injuries. You may also like to watch the video on the right to learn exactly how the OSMO Patch works. Common Causes of Foot Pain. Below are some of the most common causes of foot pain. Bursitis in the foot occurs when a small sac within the foot called a bursa, which normally acts as a cushion between the bones and overlying soft tissue, becomes inflamed. This same sac fills with fluid causing extreme pain. There are several of these small bursa sacs throughout the foot and they are all susceptible to injury leading to bursitis. 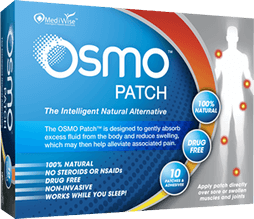 For further information and to discover how the OSMO Patch can help relieve swelling and the associated pain due to medically diagnosed Metatarsalgia simply click on the link below. Pain and inflammation felt in the ball of the foot is medically known as Metatarsalgia. Metatarsalgia is considered to be a very common cause for pain in the feet. It is not only caused by women’s fashion heeled shoes but can also be caused by both men’s and women’s flat normal shoes. For further information and to discover how the OSMO Patch can help simply click on the link below. The most common cause for pain in the arch of the foot is due to a condition known as plantar fasciitis. Plantar fasciitis is the name of the condition that occurs when a fibrous band of tissue that connects the heel to the toes (called the plantar fascia) becomes inflamed. Normally pain occurs early in the morning or after long walks. Even prolonged standing will often result in pain due to plantar fasciitis. For further information and to discover how the OSMO Patch can help relieve swelling and the associated pain due to medically diagnosed plantar fasciitis simply click on the link below. Fractures and breaks will usually cause extreme pain in the feet. Please consult your health care professional if you are experiencing any extreme pain in the feet.